Melbourne Trio 449 is a group of 3 extraordinary musicians who have been performing together for many years. Skill, talent, musicianship and fun are what it’s all about for these 3 musos. These members have been playing music for most of their lives and have performed in many bands all over Victoria. 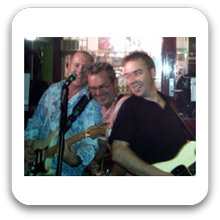 Melbourne Trio 449 have been exciting audiences for well over 15 years playing the songs you know and love and are regularly re-booked by very happy customers. What we do comes from the hearts and our hands. Many bands these days use sequencers and pre recorded backing tapes… a bit like karaoke really. The only gadget we use is a drum machine which we turn on and off for our back beat. This is so we can control the volume and fit into the smallest corners and still produce a great sound. All the rest is us. All the vocals are real. All the guitars are real and all the solos are real. Melbourne Trio 449 love to play. It is all about LIVE music played by REAL musicians. Can perform as a: 3 Piece Band and are available to perform in Melbourne and Surrounding Areas. Had a great night with the band. Had heaps of good comments. Recommend them highly. Very accommodating and fitted in well. Made a great night even better.